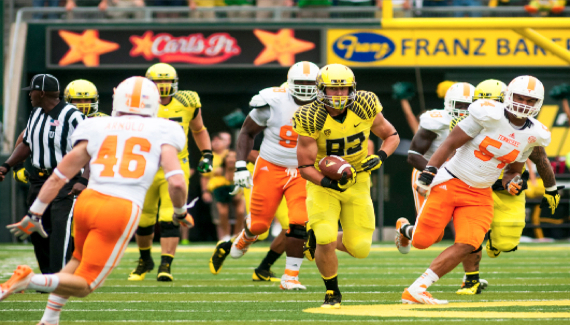 In light of Johnny Mundt’s breakout performance against Tennessee with five catches for 121 yards and two touchdowns, FishDuck wanted to reflect back on our profile of Mundt from shortly after Signing Day. Be sure to check out our Duckling Profiles to familiarize yourself with Oregon’s first-year players, so when one has a breakout game, you can be ready to know all about them! This article originally ran on February 7th, 2013. Oregon’s young and versatile tight end group just became younger now that 4-star John Mundt has signed his letter of intent. He comes out of Modesto, California from Central Catholic High School where he just led his team to a Division IV state title. Mundt initially verbally committed to Oregon last summer prior to his senior season. John rose in the recruiting ranks amidst his solid junior season at Central. He started on both sides of the ball while racking up 17 rec, 314 yds, 5 TDs, 45 tkls, and 7.5 sacks. 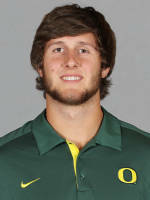 Apparently the Ducks saw enough and offered him a scholarship. Believe it or not, he had even better numbers throughout his 2012 senior season. 33 rec, 625 yds, 8 TDs, 80 tkls, and 15.5 sacks… Wow. First of all, he stands at 6’5″ and weighs 235 lbs. That is an impressive size at most positions off of the line, nonetheless at tight end. As a receiver, he is a more possession type of player with great hands and no fear. Mundt is the kind of guy who’ll risk his body on a slant up the middle and come down with the ball 99% of the time. And as a blocker, he is a very disciplined athlete who can serve just fine in our run offense. Let’s assume he’ll put on a bit more weight and become much more stronger and powerful on the line. There is a bit of a logjam at tight end at the moment (Lyerla, Baylis, Brown) so a redshirt freshman season may be in his near future. However, tight end/special teams coach Tom Osborne feels like he can be a great asset on special teams with his size. Fellow TE/LB recruit Danny Mattingly looks like he will come into Eugene primarily as a linebacker so don’t expect to see John taking snaps at linebacker. 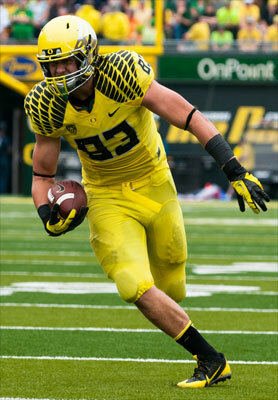 I see his former Duck comparison as David Paulson; being a very reliable, disciplined, and composed tight end that’ll never let you down. The sudden departure of ol’ Chip left many recruits with mixed emotions along with confusion. It was unfortunate to see Dontre Wilson head to Ohio State, but it was very relieving to see such great recruits as Johnny Mundt stick with our program and make 2013 one of the highest rated recruiting classes of the 2000s. *Check out our new pregame opponent analysis on Saturday mornings. Our analysis will be unlike any other, so learn what to watch for before the game on Saturday! *Want some College Football humor? Check out FishDuck.com‘s GIF Collection! (Click here) Pass it along! *If you would like to join the other 80+ volunteers at FishDuck.com, and have five hours a week to donate . . . we have slots open for volunteer Editors, Writers, Analysts, Photo Archivists and Social Media Associates. Can you help us manage people? Consider our volunteer Sales Manager and HR Manager positions and give some time each week to help young associates learn! E-mail us at charles@fishduck.com.